Manitowoc is the largest manufacturer of ice machines in the USA! 2-3 day avg. delivery. Kolpak is the largest manufacturer of walk in coolers & freezers in the USA! Hoshizaki is one of the world`s largest manufacturers of commercial ice & refrigeration equipment. Advance Tabco is the largest manufacturer of fabricated food service equipment & institutional products. Dito Electrolux by Electrolux Professional is a leading manufacturer in food preparation equipment. Admiral Craft Equipment Corp is in business since 1952! Kitchen products, such as smallware, tenderizers, carts, grinders, fryers. Cecilware is a leading manufacturer of food service, beverage, cooking and fountain equipment. Master-Bilt has been producing the finest refrigeration equipment for over 70 years. Merrychef Over 60 years of product experience and culinary expertise drive Merrychef’s innovative, award-winning technology. Electrolux Professional Over 60 years of product experience and culinary expertise drive Merrychef’s innovative, award-winning technology. Vulcan is the hardest working, most dependable commercial cooking line in the world! Frymaster is the hardest working, most dependable commercial cooking line in the world! Hobart is the world`s leading innovator of food equipment, systems and service. Garland US Range Make your kitchen more efficient than ever with the help of Garland cooking equipment! Dean fryers are known throughout the restaurant equipment industry for their superior performance and quality. Traulsen is a Hobart company that builds the finest refrigerators and freezers for the commercial industry. Cleveland Range equipment manufacturer is well-known in the industry for its innovation in commercial steam cooking equipment. Perlick is a leading producer of high-quality, durable and efficient commercial bar equipment. Delfield has been a trusted name in the restaurant equipment industry for years. Beverage Air is one of the largest suppliers of commercial refrigeration in the foodservice and beverage industries. When you’re shopping around for commercial kitchen equipment, you want a supplier that’s an authorized dealer of top brands, provides the guaranteed lowest prices and is staffed by a team of well-trained commercial kitchen experts. Only one company checks all those boxes and more, and that’s CKitchen.com. Not only do you get an unbeatable selection and top-quality service here, but you’ll also appreciate that 10 percent of our profits go to charity, so you can feel good about shopping with us. We’re one of the web’s top commercial kitchen suppliers, and can even provide you with professional food service consulting and kitchen design services based on your individual needs and budget. 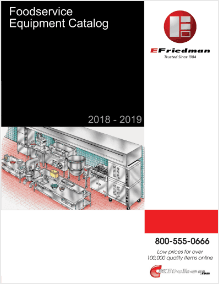 Our selection of commercial kitchen supplies includes everything from cutting-edge bar, bakery and concession equipment to catering equipment, supplies and appliances that can handle large volumes. It doesn’t matter if you’re operating a brick-and-mortar restaurant or food truck, CKitchen.com can outfit your business with the supplies required to boost efficiency, sales and productivity. We have commercial food preparation equipment, gas and electric ranges, ice machines, refrigerators, walk-in coolers and freezers, beverage systems, sinks, tables, shelving, and many more supplies that will help transform your commercial kitchen so it can handle even the most demanding needs. If you’re in the market not only for the best food service equipment at guaranteed low prices, but also need a professional’s design eye, CKitchen is a great partner. Our professional food service consultants and designers will come up with a commercial kitchen plan that suits your exact needs and budget, and one that can save you a substantial of money on the costs associated with energy, health department requirements, efficiency and overhead. All of our equipment comes backed by a low-price guarantee, so your new kitchen is sure to leave behind extra room for hiring and design in the front of the house. We feature more than 50,000 quality items online and have more than 300,000 total items in our product database. Please call our trained sales consultants at 800-555-0666, option 3 to get help with items online or products featured in our offline catalog.